When the sun goes down at every American Cancer Society Relay for Life event, hope shines the brightest. During the Luminaria Ceremony, hundreds of luminaria light the track or path to celebrate the lives of those who have battled cancer, remember loved ones lost, and fight back against a disease that has taken too much. This ceremony of light symbolizes the hope and perseverance with which we all continue to fight. You can give to the American Cancer Society and keep the flame of hope lit by dedicating a luminaria in memory of someone lost to cancer or in honor of someone still fighting or who has beaten the disease. Luminarias are $10 each and can have up to 10 words of dedication in addition to the name. Forms can be found HERE and must be returned by Thursday, April 18, 2019. Save the Date for the 2019 Mabry Talent Show on Thursday, April 18th from 6-8:30 pm at Plant High School Auditorium. Thank you to our Mabry Sponsors! The Mabry Elementary Media Center has a Facebook page! Hop on over and like/follow it for updates on all things media center related! 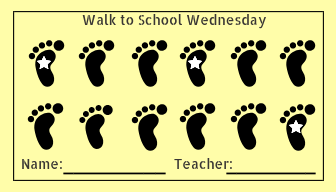 Walk to school every Wednesday and fill those punch cards ! Here's the map of walking routes and additional details. A meeting is scheduled on Tuesday, May 7th from 6 - 7 pm in the Coleman Cafeteria. The Dolphin Depot is online! Click here to order your items. Check out the order by dates to ensure your delivery arrives in time.